This entry explores the utter excitement of the archaeology, and complete depression of the visitor experience, of the Neolithic-Early Bronze Age Winterbourne Stoke barrow cemetery. It is part of the Stonehenge Landscape managed by the National Trust. The EH survey of the cemetery by Bax et al published in 2010 can be downloaded here and Pastscape gives basic information about it. I cannot work out how many mounds are ascribed to the barrow cemetery, but these are actually the tightest concentration of a far wider distribution of monuments along a NNE-SSW alignment following a ridge (and thus a threshold for those moving in and out of the Stonehenge landscape) W of Stonehenge, on the edge of the World Heritage Site. 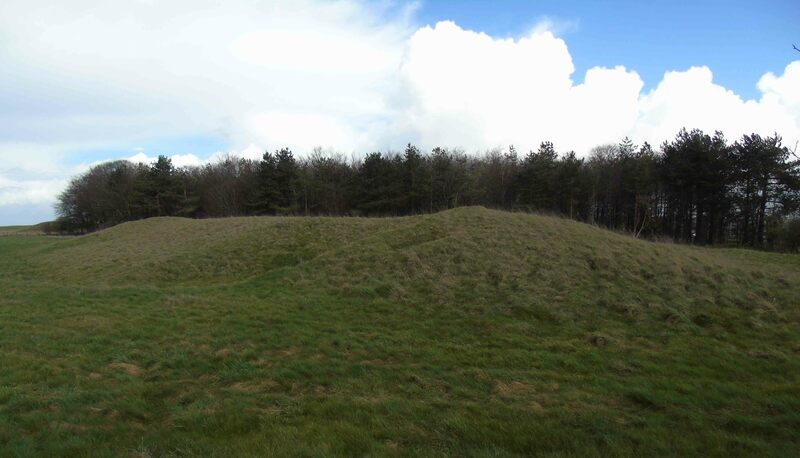 The survey follows earlier conventions of identifying 21 barrows, but there are an additional 6 recognised in the latest survey (3a, 7a, 16a, 21b, V and H) bringing us to around 27 visible mounds. Finds by Cunnington from the ‘King Barrow’ (bell barrow number 5) and an aerial view of the barrow cemetery looking SSW towards the A300 roundabout. The Neolithic earthen long barrow – the Crossroads Long Barrow – is the earliest monument in the cemetery. It was aligned along the ridge, which perhaps auspiciously is aligned in midsummer sunrise. Investigated by John Thurnam, a skeleton from his excavations are on display in the Stonehenge Visitor Centre. This monument of the mid-4th millennium provided the focus of cemetery a millennium-later during the mid- to late 3rd millennium BC when the Early Bronze Age barrow cemetery was laid out, possibly over centuries. 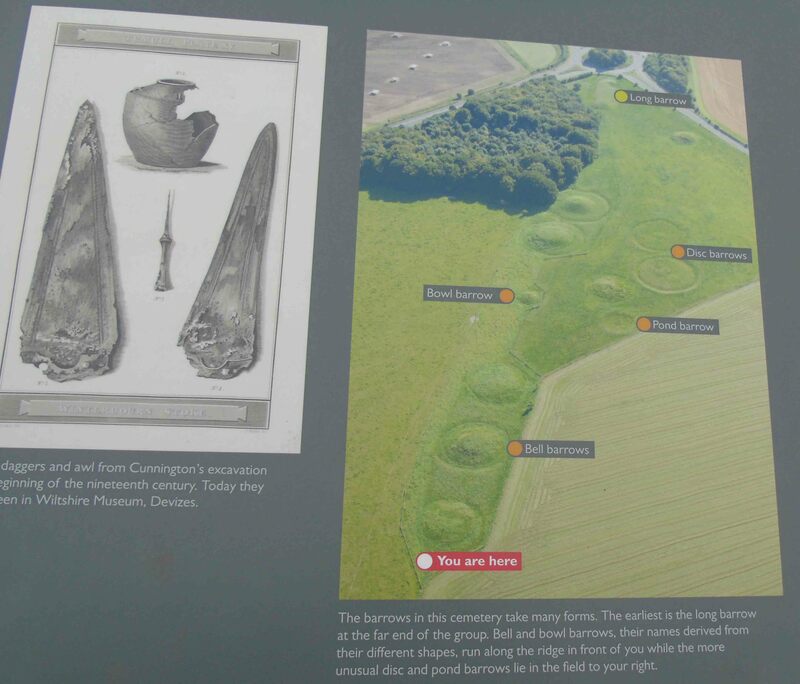 The long barrow was itself reused for burial in the Early Bronze Age (evidenced by a Food Vessel). The excitement comes from the fact that this is not just any Bronze Age barrow cemetery. In many ways it is the barrow cemetery that somehow epitomises archaeologists’ typologies and ideas of the external appearances of prehistoric monuments in Wessex. First, there is the early Neolithic long barrow discussed above. Added to this is the multi-linear arrangement of Wessex ‘fancy’ barrows: there are large bell barrows (with berms between the mound and the ring ditch and sometimes with an external bank – other examples I have recently discussed are at the Cursus Barrows), bowl barrows (mounds with or without a ring ditch), two disc barrows (a circular ditch with external bank, surrounding a flat platform, containing one or more small mounds) and two pond barrows (circular depression with an embanked rim) as well as smaller round barrows that do not fit into this typology. The development and relationships between the Early Bronze Age monuments is far from clear. The relationship between monumentality and mortuary practice is clearly complex but is obscure for both visitor and in the specialist reports. After all, most of the cemetery has escaped investigation and most excavations were antiquarian ones. Still, one – subsequently know as the ‘King Barrow’ (Barrow 5) – was found to contain two bronze daggers, an awl and a 5-handled jar comparable to examples found in Brittany. 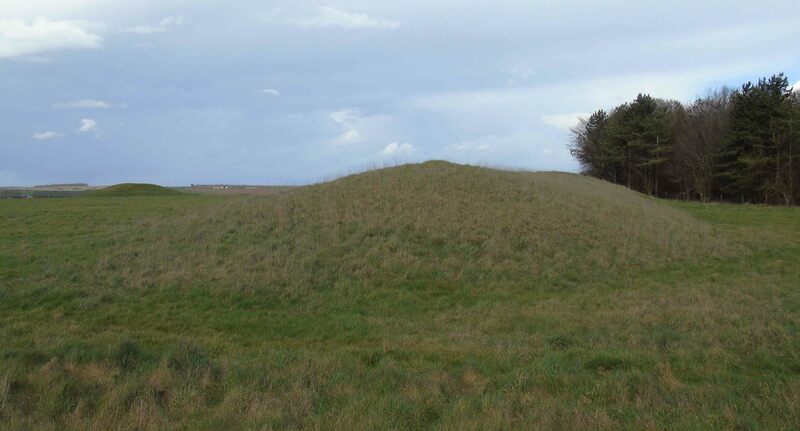 Through antiquarian and more recent excavations, the burial mounds covered primary positioned cremation and inhumation graves as well as receiving augmentation in size and multiple additional interments. It is possible that these cemeteries began as ‘flat-graves’, slowly developing as hengiform monuments and then into full-scale barrows over time. Bax et al.’s 2010 report talks about some possible stratigraphic relationships between the bell barrows 3-5 which suggest that (at least in part) the axis sequential building might have been towards, not away from, the Crossroads long barrow for at least part of the cemetery’s stretch. However, they rightly note how each monument was individually most likely multi-phased, so final perceived stratigraphical relationships need not reflect the relative dates that each monument began its life. Around the cemetery’s southern and western sides are earthworks associated with ‘Celtic’ field systems of later Bronze Age date to the south. 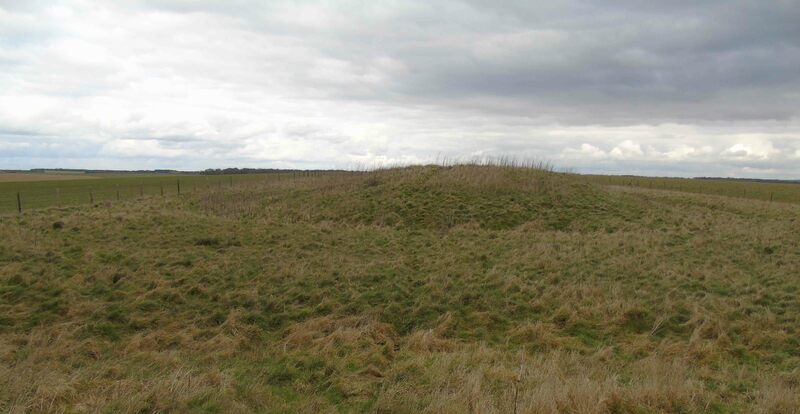 Later Bronze Age houses were excavated from what is now beneath the roundabout and at least two of the mounds were reused for cremation burials during the later 2nd millennium BC. There is no evidence of Iron Age, Romano-British or medieval (including Anglo-Saxon) activity in the area. The cemetery became used in the line of the Winterbourne Stoke/Amesbury medieval parish boundary and the focus of a post-medieval plantation known as Winterbourne Stoke Clump. 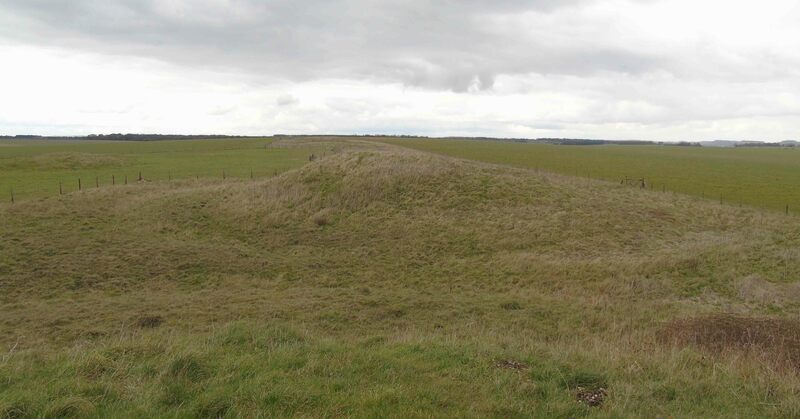 The Larkhill Military Railway crossed over the site through the plantation and through the barrows. 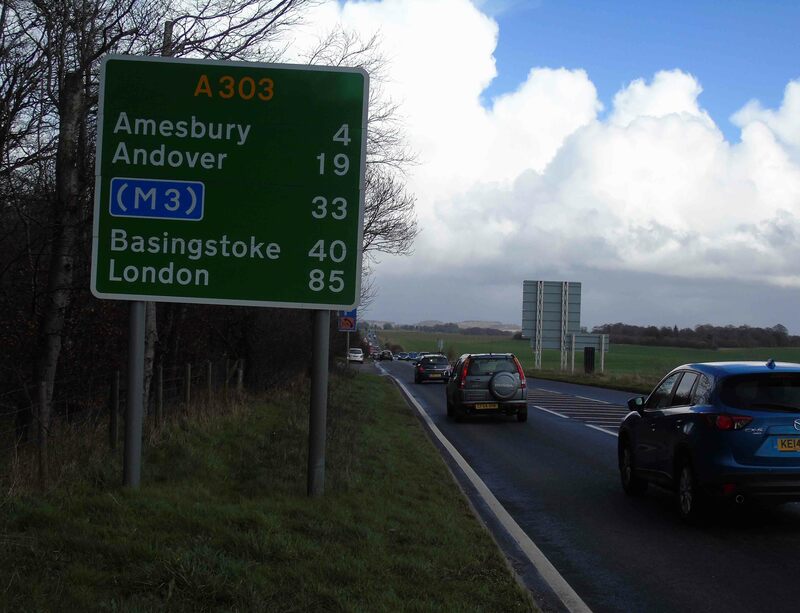 The A300 runs through the site, adjacent to the long barrow, and the former crossroads is now a roundabout: a 20th-century circular addition to this monumental complex. The excitement of the archaeology here is not matched by the visitor experience. 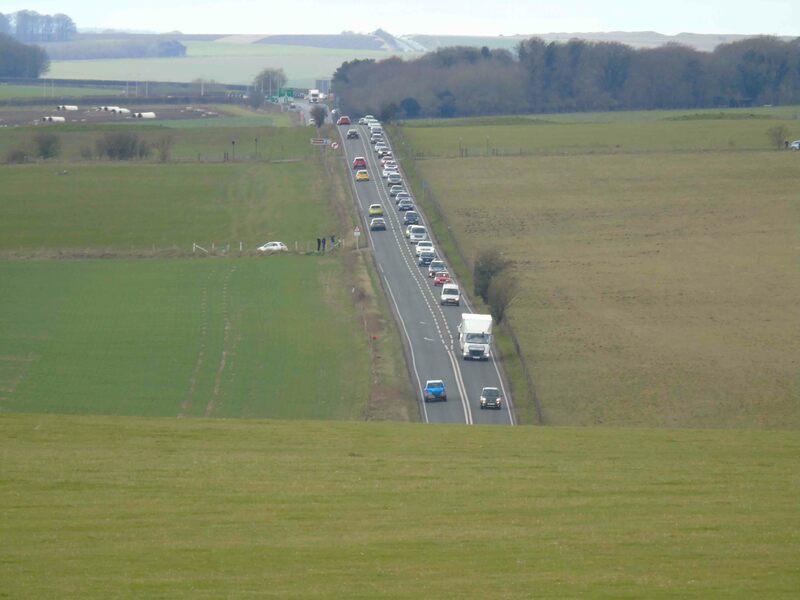 Unlike the eastern parts of the Stonehenge landscape where the NT website map out walks, it appearss utterly impossible to access the cemetery safely on foot without walking along the horrendously busy A303 or from the Stonehenge Visitor Centre car park. Actually, you can walk from the road between the Visitor Centre and Stonehenge to the Winterbourne Stoke barrow group but is that really clear enough to visitors? To me, the only option seemed to be to go by car. I parked in the layby surrounded by mountains of litter beside the National Trust sign adjacent to a parked up car of an elderly couple. The woman was sitting in the car, the man was urinating in the trees. I then walked through the stacks of litter and on through the plantation to the barrows. There is no indication of what is worth seeing en route, so I am not sure visitors will know what to expect. Once there, disappointingly the long barrow and many of the mounds closer to the roundabout are inaccessible; protected by an impassable fence. The only clear view is to go back to the layby and walking along the edge of the busy road to stand by the roundabout with the din of the traffic. 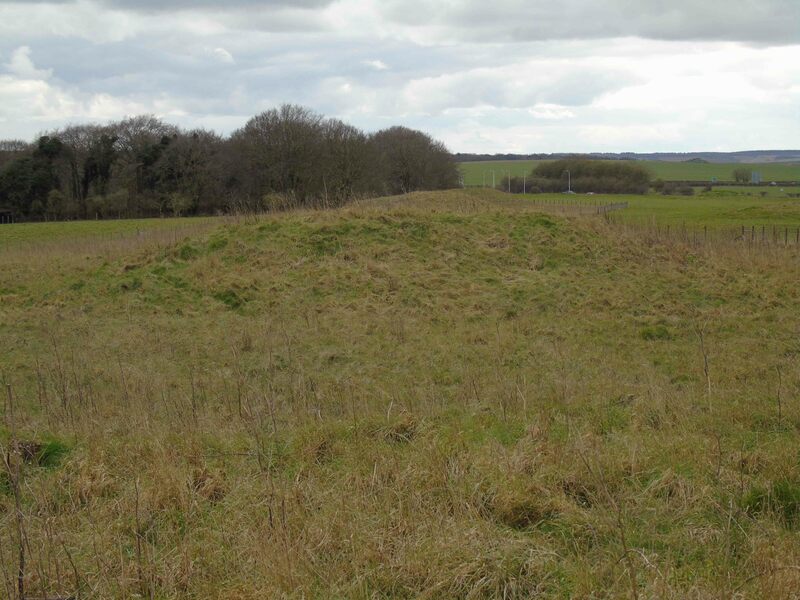 For the accessible area, one can walk around and over the main bell barrow line and look out to the other monuments, but this is a car-circumscribed and fenced island within a wider rich archaeological landscape. There is a general signboard from which I took pictures, but not sufficient detail to understand the possible sequence and complexity of Neolithic and Early Bronze Age monuments and mortuary practices on display. As for the later landscape, or that you are walking the line of a medieval parish boundary: nothing is said at all. 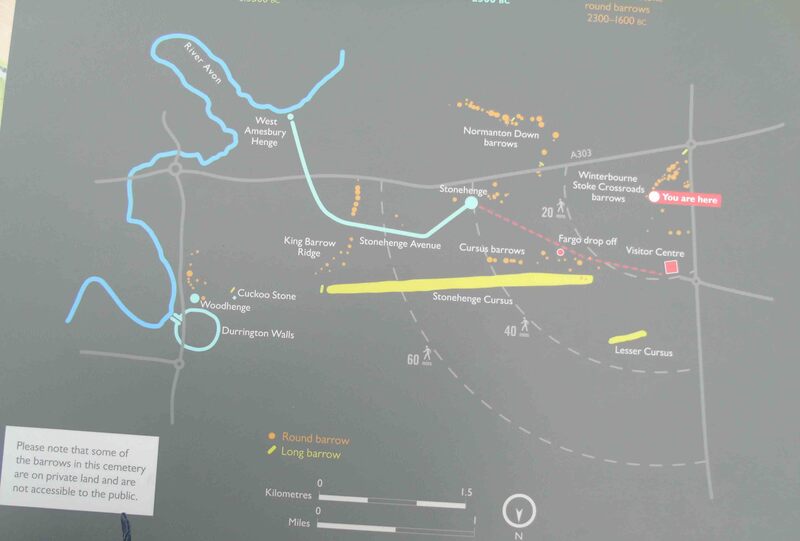 In summary, this is an exciting ‘must see’ for any visitor to the Stonehenge landscape, but I feel it is easily missed and still difficult to access and comprehend as a visitor.